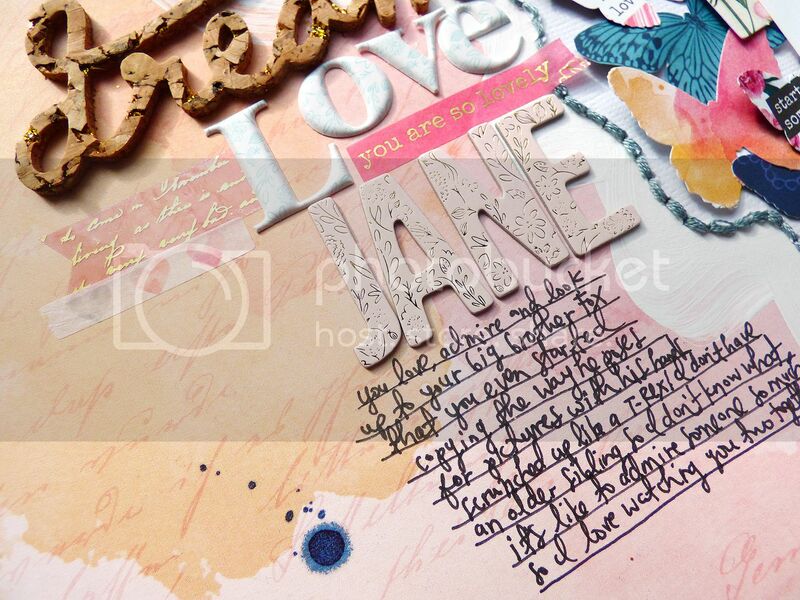 DESCRIPTION: I love the paper with all of the different squares of patterns/phrases and wanted to include as many of the patterns/phrases as possible. I had to think of a shape to punch them into first... butterflies! There are quite a few butterflies in this line and I have a few different butterfly punches, so, it worked out! JOURNALING SAYS: You love, admire, and look up to your big brother Fox that you even started copying the way he poses for pictures with his hands scrunched up like a t-rex! I don't have an older sibling so I don't know what it's like to admire someone so much so I love watching you two together. 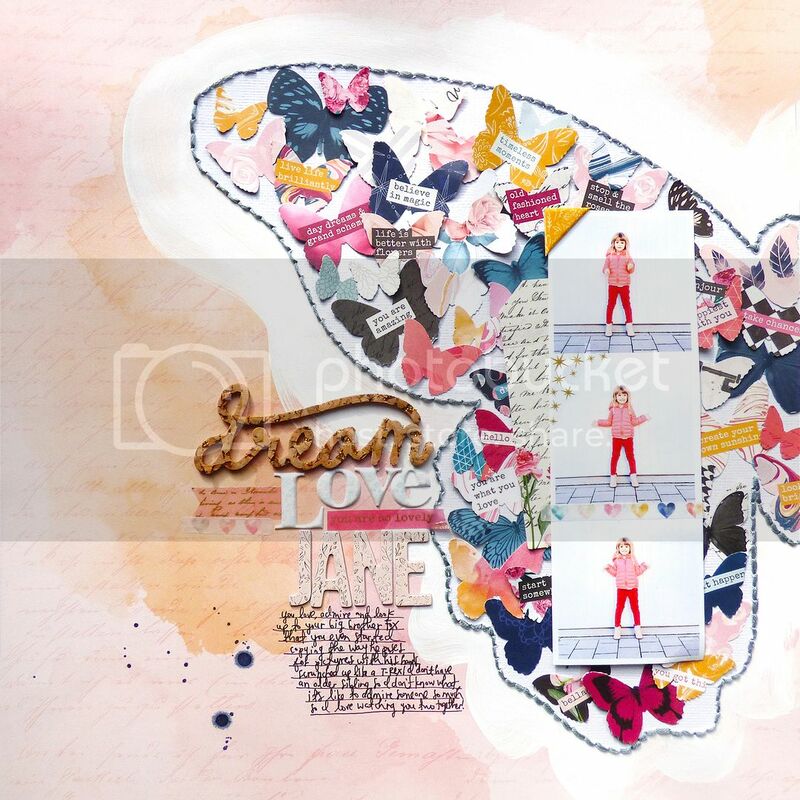 HOW TO: Draw a half butterfly onto the right side of a patterned paper background using a Silhouette Cameo, pierce holes every 1/4" or so, paint over with white paint, then backstitch with gray thread. 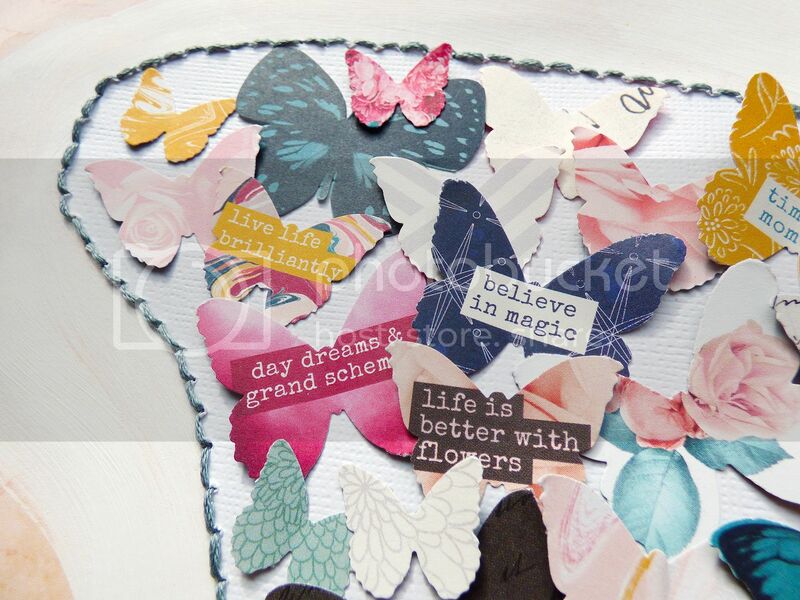 Punch butterflies from lots of patterned papers and fill in the stitched butterfly. 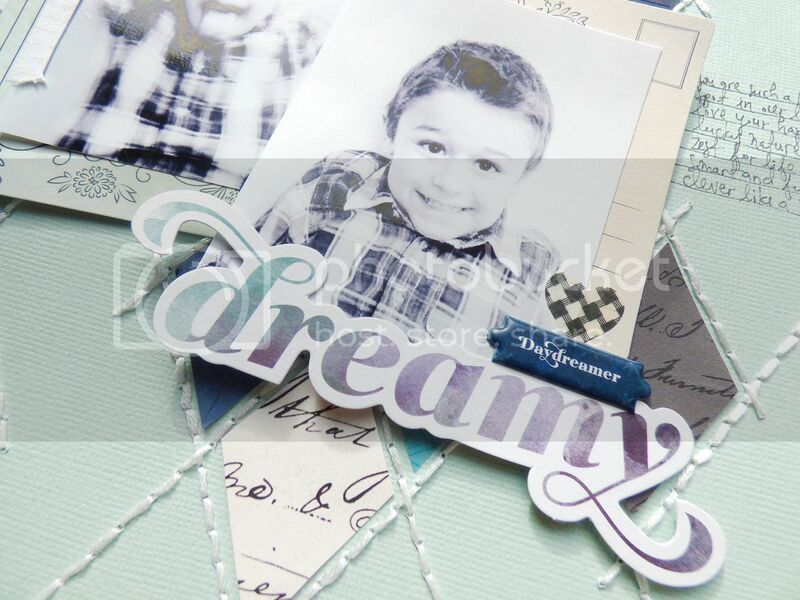 Layer a trio of photos over a tag, then apply a rub on, a piece of washi tape, and a corner puffy sticker. Create a mixed title on the left and journal below. Drop dark blue mist on the bottom left corner. DESCRIPTION: It seems like I hardly make layouts for Fox anymore and I feel absolutely terrible about it! Here's my resolution to make more pages for my guy! HOW TO: Draw the diamonds background onto mint cardstock, pierce a hole every 1/4" or so, then backstitch with white floss. 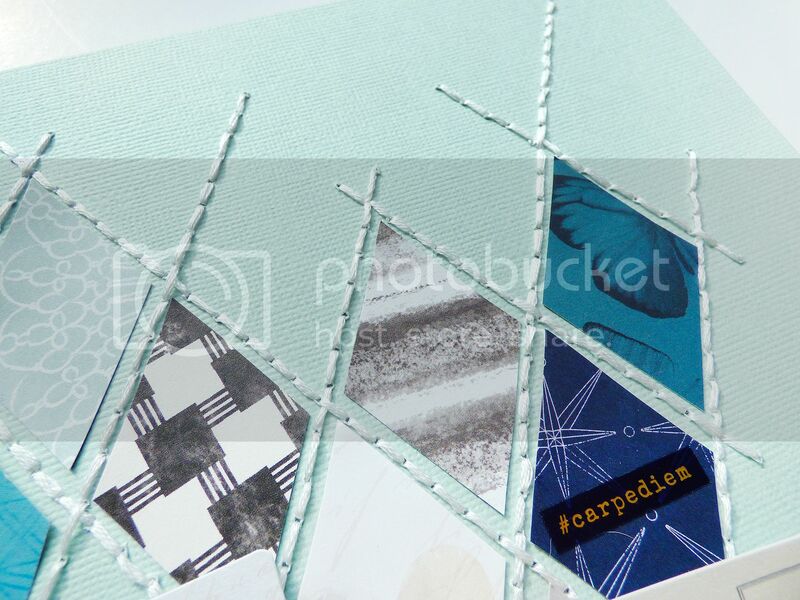 Hand cut diamonds from patterned papers and fill in the complete diamonds. 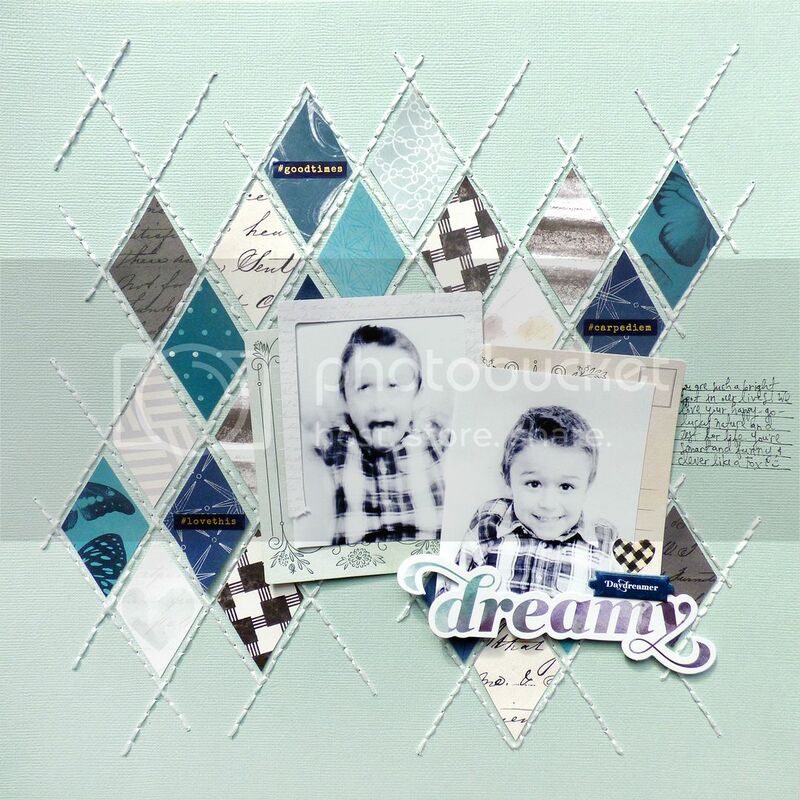 Layer a pair of black & white photos over die cuts and embellish with a few stickers. Journal on the right edge. Should I have added spray paint splatters?! I might go back in and add them. If you would like either cutting/drawing file, just send me an email! Ohhhhhhhhhh these are gorgeous! LOVING the little butterflies within the bigger one on the first one and loving those diamonds on the second one!!!!!!!!! !